Hilton HHonors has decided to extend its Double Your HHonors promotion until August 31, 2015. The promotion was supposed to end on May 31st. The promotion allows you to earn double points or airline miles for your stays during the offer period. There no non-participating hotels for this promotion from June 1st. 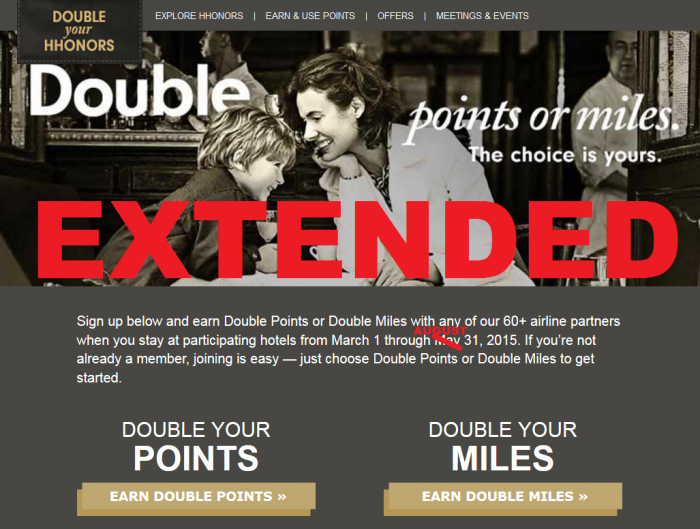 Note that once you have chosen to earn either double points or miles it cannot be changed. Hilton made an announcement earlier this year that they would cut down the number of their global offers from four to just two and that they would offer targeted offers at other times. You can access my post about this change here. Seems that they have decided to backpedal on this decision due to competitive pressures. Why would I stay at Hilton affiliated property if there are no promotions while other chains have? I am glad that ALL the hotels participate to this promotion for the June 1 – August 31, 2015, period. There were 776 non-participating hotels for the March 1 – May 31. Offer valid for eligible stays completed between March 1 and August 31, 2015 (“Promotion Period”) at any participating hotel in the Hilton Worldwide portfolio. Hilton HHonors™ members must first register at HHonors.com/Double prior to check-out of your first stay within the Promotion Period. Your selection of Double Points or Double Miles applies to all eligible stays completed during the Promotion Period at participating hotels and cannot be changed. Registered HHonors members will receive the selected bonus only for nights completed during the Promotion Period, regardless of a check-in date before the Promotion Period begins or a check-out date after the Promotion Period ends. If registering for Double Miles, you must select Points and Miles as your Double Dip™ Earning Style within your HHonors profile. “Double Points” means you will receive a bonus equal to the number of Base Points earned during a stay. Bonus Points earned on Base Points do not count toward tier qualification. Double Miles are available only with participating airlines. A preferred airline must be selected in your HHonors profile. Airline Miles accrued and awards issued are subject to the Terms and Conditions of each participating airline’s reward program, as applicable. Certain airlines may not participate with the brand at which your stay is consumed. For details on the eligibility of your stay to earn miles, please click here. Please allow six to eight weeks from completion of your stay for points or miles to appear in your HHonors account. Offer is not transferable, is not valid for groups and cannot be combined with other select offers.